Everybody likes to use two way radios. Some people think that it makes them seem like a spy or a law enforcement officer. Some people go camping or go hunting on a regular basis and need some method of keeping communication with others when their cell phones are not working. Whatever the case, it is time to admit that two way radios are both fun and necessary when you are going to be outdoors or in the field. One thing people do not consider, however, is how useful they could be when you are NOT in the field. Picture yourself in your home having a BBQ with your friends and you realize your child isn’t home from school yet. Where could they have gone? Maybe they didn’t have access to a phone, maybe not. If you both had a two way radio, communication would be extremely simple and you could find out right off the bat. Kids are one demographic which are often overlooked by both consumers and producers in the two way radio market. This is simply because kids don’t have money to spend on a cool camping gadget like adults do. So they are largely ignored. Parents, however, should be taking note of good two way radios. They are a quick and affordable way to add a means of communication between you and your child without having to splurge on a new cell phone or add the child to your wireless plan. Consider two way radios, there are a myriad of benefits and very few, if any, downsides to their use. Why Even Buy Two Ways for kids? Keeping track of your children can be very difficult at times. With that being said, it can be made easier with the use of two way radios. 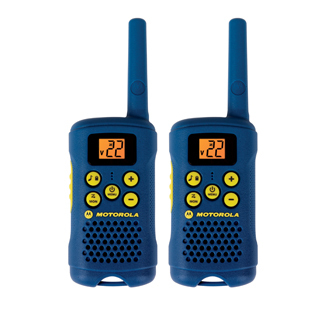 The question that always comes in response to that statement is this one: Why buy a two way radio set when my kids already have cell phones? Well, there are a couple of answers to that question. First off, many people do not have chargers for their cell phones that they carry with them on a regular basis. Having a two way radio presents you with a nice backup plan just in case. Second: Dead zones. There are tons of dead zones for cellular service, including schools, in many cases. So how does one respond to this? Use a different method of communication if you can. Two way radios are a great backup for this purpose. Finally, consider the fact that many people simply do not have landline phones anymore. Should you find yourself in a situation where you need to contact your child and they either do not have a cell phone to use or they cannot reach you through a landline, two way radios are a terrific backup. What to Look for in Kids Two Way Radios. • Bright colors will attract attention to the radios. If your children become lost this will help to make them a bit easier to spot. If the kids lose the radio itself, they will not have such a hard time trying to find it because it will not blend in as well with the surrounding environment. • Look for something that will be able to stand up to some serious punishment. Kids are not like adults. They do not constantly pay attention to their electronics to prevent themselves from accidentally dropping or breaking them. Kids are out there in the field and in the mud getting dirty and dropping things and falling down. Constantly. So you want to make sure that falling onto a radio or dropping it from a few feet isn’t going to break it beyond repair. Nobody wants to lose track of their kid because somebody dropped a radio and it broke all to pieces. • Range does not have to be crazy. Range is important up to about two or three miles, then it quickly becomes a bit too much for what is required. Your children should be able to communicate with you for a reasonable distance, but you do not need to go off buying a twenty-five or even a ten mile radio, because if they are that far off there is probably an issue anyway. Remember, this is for shorter-range communication and to stay in somewhat constant contact with them. • Another important thing to keep in mind is that you need the radios to be easy to use. This also means easy to teach. Frankly, kids are not as smart as adults. They are not going to be able to grasp some of the more complex concepts that are involved in the use of many radios. As such, it is very important to find a radio that is pretty much good to go right out of the box. If you can do that, you will have no problem teaching kids how to use the radio either. • Weight is another consideration that you will have to keep in mind. Kids usually don’t have the kind of strength that would be necessary to carry a heavy radio for long periods of time. Look for something light that will fit into the palm of their hand. The other issue that comes with weight is size. You want something smaller rather than something that is very large. That is simply the better option when it comes to choosing a radio for kids. • Complexity should be kept to a minimum. Though functionality is important, it is more important that the ideal user is able to figure out the use of the radio without having to constantly refer to documentation or, in the case of children, simply be lost altogether. • Remember that two way radios are not toys. They are not toys. They serve a very important purpose in terms of safety and communication. While they might, at times, feel very fun to use and kids can definitely have fun with them, it is important to both explain to children that they are not meant to be used as toys and that they have a specific purpose. You should probably avoid buying radios with a bunch of Disney characters or other cartoonish graphics on them. Not only are they usually on the lower end of the spectrum to begin with, but they might make the tool seem less serious in the eyes of the children who will be using them. If you keep these tips in mind when you are exploring your two way radio options, you should be able to find something that will meet the needs of both you and your children. Some two way radios that are currently on the market are simply better for kids. This section will outline a few of the top choices. Of course, each two way radio will have unique pros and cons, so choosing one is not as simple as just looking on this list, but this will definitely be a good starting point. • Motorola Talkabout MD200TPR – This is one of the best. It is not strictly advertised as a radio for kids, but it is, nevertheless, one of the best. Many reviews on marketplaces rail about how wonderful the radios are and how great they work. The coloring and the ease of use makes these radios a great choice. Better yet, they are inexpensive and they come in a three pack. 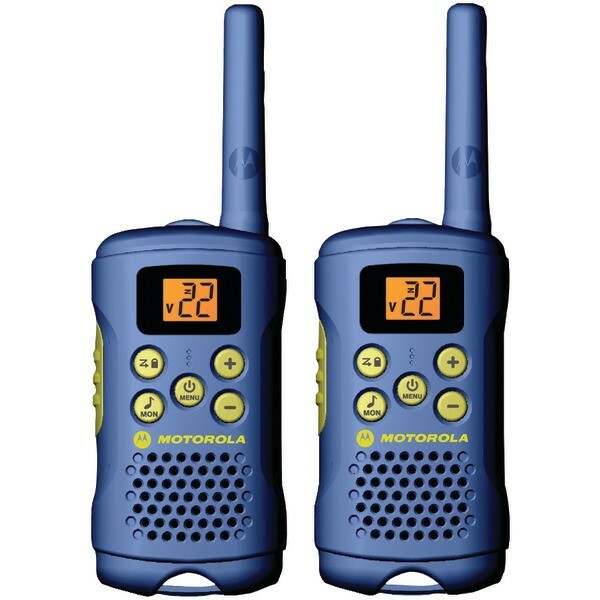 • Motorola FV300 – This is a pair of two way radios that costs around $40, all told. It is not a bad choice, especially for kids. It has a good range, has great reviews online, and it is easy to use. While it does not have some of the complexity that other radios, that is actually a benefit in this case. The case is bright blue, so it will not be lost very easily. Additionally, this radio comes in a small case that will easily fit into the hands of most children. It is a great choice if you aren’t sure what you need. • Retevis RT602 – A bright orange radio set for under $50, this is a good choice for kids as well. One of the benefits of this radio set is that the radios themselves have a bright LCD flashlight attached to the bottom which can be used to act as a signal if someone gets lost. The battery life is good, the unit is easy to set up and use, and the case of this unit is bright orange. The case itself makes this a good choice for kids but the fact that the radio is affordable as well really sets these apart from most others. • F2D T388 – This is a great radio for kids. The case is a very bright blue color which is great for improving the visibility of the radios in the field. It is priced at around $25 as well, which sets it apart from many other radios listed for children. The units work well for the price and they are a good choice if you want to introduce your children to the usage of these types of devices without having to break your bank to do it. • Motorola MG160A – A bit more complex than most of the entries on the list, this is still a well-priced offering from a great company. It is simple enough for kids to use and it has easy to see buttons and a blue color which is great for improving the visibility of the unit as a whole. Kids will find it very easy to use and it can stand up to a beating in the field. If there was an issue with this unit then it would probably have to be the antenna, which is prone to breaking during times of stress. Of course, that won’t happen unless the unit is withstanding some sort of impact (such as falling) to begin with. • Towallmark – A hot pink two way radio set that is easily small enough for a child to use. The visibility, again, is great on this unit. Though it does have some small problems, it is not very expensive, has a good range, and has a lot of things going for it. This one should definitely be considered if you are on the market. With that being said, there is no way to tell how long it will hold up through consistent use, as the company that makes it is relatively unheard of in the market. • Retevis RTA1 – Great radio set from Retevis. This is another wonderful selection if you need a child radio. This one is bright pink and black in color and is small in size so it will work great for kids. It features 22 channels and it has a bright LCD display on the front. 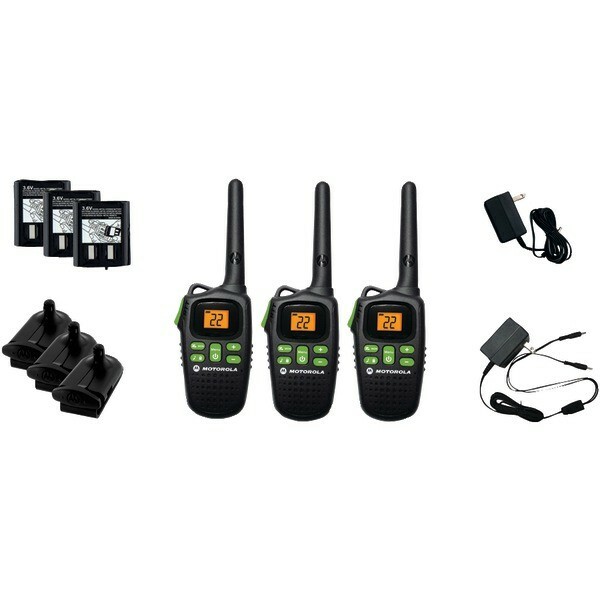 The unit is also easy to understand and use, even for novice users of two way radios, so it is a great choice if you are looking for a two way radio set for kids. Looking for two way radios for your kids is likely about something more important than simply finding some cool camping gear. It is about safety and communication. It is of paramount importance that you spend plenty of time doing your due diligence on the radios that are available and make sure that you test them out with your kids ahead of time so that they understand exactly how the radios work. This is important because, in the heat of the moment, it can become extremely easy to lose track of what you are doing. For children, who are not fully developed, it can be next to impossible to figure out how to use a new piece of electronics when they are stressed. Spend time researching and finding the right radio for you and your kids and you won’t regret it.